A joint production of Nintendo and Namco, but produced with the Namco brand name with the Triforce hardware comes Mario and friends in a crazy racing game. 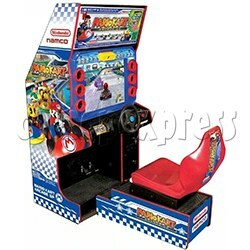 The players have the choice of many character Nintendo characters such as as Mario, Wario, Donkey Kong, Bowser and more. The game contains a battle mode were players can collect items and weapons to win the race. As well as a more traditional racing mode. There are 24 tracks across 6 different worlds. Other features include NamCam which is a small digital camera, that takes the picture of the player and digitally alters it to resemble the character they have chosen. That picture is then display above the player's vehicle for the other players to see. All tracks also contain a number of gold coins scattered around, players can collect these.